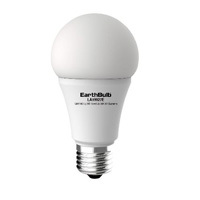 5.5 watt A19 Omni-directional EarthBulb LED general purpose bulb provides 480 lumens and replaces 40 watt incandescent directional bulbs which may provide over 80% energy savings. 2700K color of light is standard with 3000K and 5000K available. Great for use in table lamps, floor lamps, wall sconce, and task lighting applications. Multi-Chipset LED and an advanced cooling system provides for 15,000 hours of LED life. Medium screw base. May be used in totally enclosed fixtures. Also available in 48 bulk pack, 2700K. Energy Star Omni Directional Dimmable Max. Overall Length 4.38"